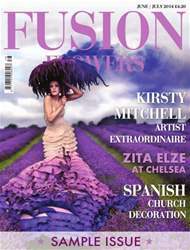 Get your FREE Sample issue of Fusion Flowers today! (0 Customer Reviews) | Write Review 6 issues per year Fusion Flowers magazine is the only contemporary floral design magazine published in the UK featuring international tutorials and content. We currently have readers in over 75 countries. Our multi-award winning magazine is released six times a year and reports on contemporary, cutting edge floristry, floral design, flower arranging, trade shows and flower festivals globally. Readers are shown how to create amazing designs in step-by-step format with clear explanations and instructions from our world-class teachers. Pick up tips and techniques to enhance your designs. From beginners to Masters - there's something to inspire everyone! Fabulous photography enhances the innovative designs and stories. We have book reviews and excerpts so that you get a flavour of the contents before buying them in our Book Club. We source not only essentials for every floral designer but more unusual and up to-the-minute accessories for your designs which can be ordered throughout Marketplace. Our writers report on all aspects of floristry and floral design and Hot & Happening keeps you in the picture on world events and new releases. Garden Notes offers inspiration and practical advice. In this issue we find out what happened when Brazilian-born London florist Zita Elze was challenged to create another of her floral gowns to be featured in a garden at the RHS Chelsea Flower Show. It certainly had to WOW factor and it was principally made from - grass! Our new reporter will be revealed as she shares her experiences at the Nordic Cup, the world-famous competition when the floral giants of the floral design world in the Nordic countries challenge one another. We re-visit the Girona Flower Festival to find some surprisingly different approaches to church design including some of the mechanics that were utilised. Find out what happened when two well-known Australian designers got into the PINK! Plus we have lots of step-by-step and all your usual favourites PLUS a surprise article featuring a global, photographic superstar - we can't wait. Fusion Flowers magazine is the only contemporary floral design magazine published in the UK featuring international tutorials and content. We currently have readers in over 75 countries. Welcome to the wonderful world of Fusion Flowers magazine. You'll receive 6 issues during a 1 year Fusion Flowers magazine subscription. You'll receive 6 issues during a 1 year Fusion Flowers magazine print subscription.